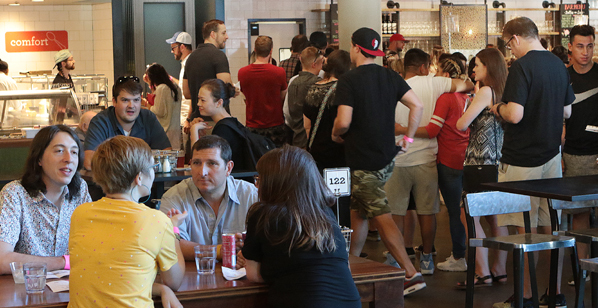 Visitors to this ‘OMSI After Dark’ stop in for an early evening snack at Theory, the museum’s upscale eatery for snacks and libations. The nonprofit Oregon Museum of Science and Industry (OMSI) continues to be a delightful family destination. But, for adults, visiting with kids swirling around the facility can be daunting. 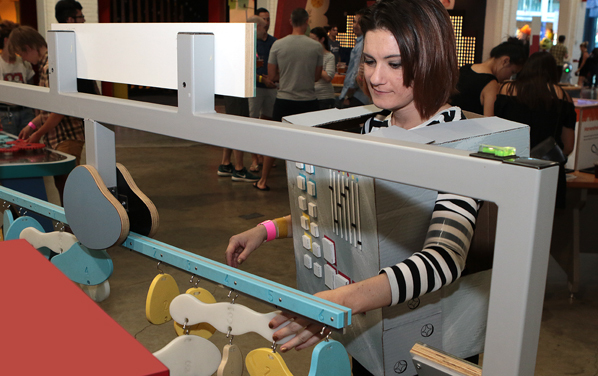 “It’s true, OMSI is seen by many as a children’s museum, and many adults don’t what to come when the museum is packed with children and school groups – which is why our ‘After Dark’ events were created,” explained OMSI Event Planner Sonali Shivdasani. 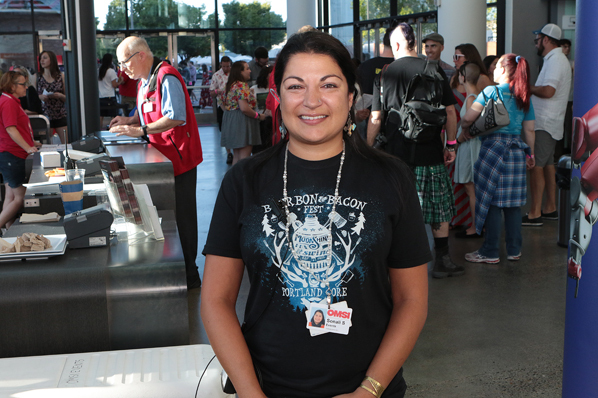 Welcoming guests to the monthly all-adult event is OMSI Event Planner Sonali Shivdasani. Getting into the spirit of this After Dark night, called “Stranger than (Science) Fiction”, we find OMSI guest Niki Scordalakes. With disc jockeys playing music, with cash bars, and with a different theme every month, this continues to be a popular “date night”. “In addition to singles, and groups of guys and gals coming, we’re told a lot of blind dates meet here, because it’s a safe place to come for something fun and interesting, yet planned for adults,” commented Shivdasani. These grown-ups prove that one is never too old to enjoy solving puzzles. 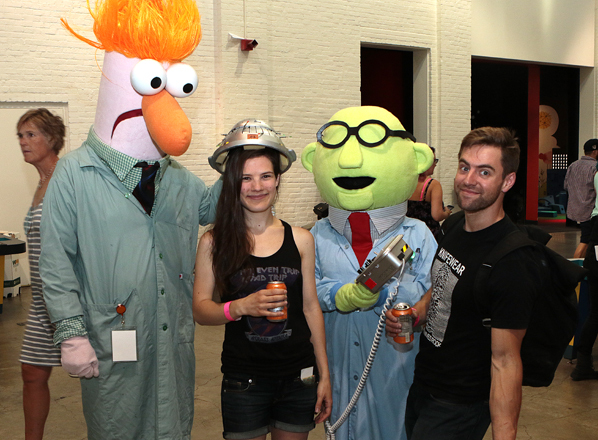 Guests Anna Sopocinski and Hunter Lea find themselves being examined by Sesame Street “scientists” Beaker and Dr. Bunsen Honeydew. “Our Turbine Hall features a mix of local food and spirit products; companies provide samples of their products, and sell them while meeting our guests,” Shivdasani remarked. At any given “After Dark” one might see a magician, a juggler, or an aerialist performing live. 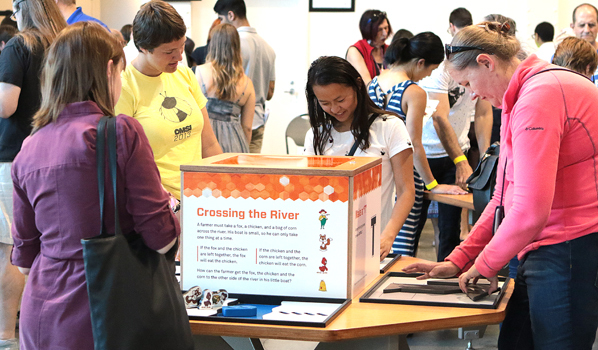 And, participants have access to all of the exhibits that are normally open during the day. 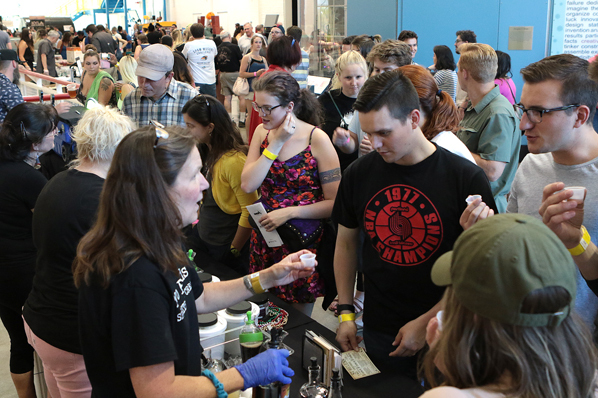 In addition to exploring the exhibits, folks attending After Hours are offered samples of foods and adult beverages. Sound interesting? Come to their last event of the year; the theme of OMSI After Dark on November 28, held from 6-10 p.m., will be “Mysteries of Egypt”.